I took a gaming break in college. I played unfinished games on my PS2 from time to time without completing them. Towards the end of college, I got into Maplestory. It was crazy addicting. It wasn’t until I graduated in 2008 that I started getting back into gaming again. My dad bought the PS3 around this time. I started with a decent collection of PS3 games. Soul Calibur IV and Tekken 6 for fighting games, a First-Person Shooter with Unreal Tournament III, a basketball and tennis game and that Motorstorm racing game that came with the PS3. None of these were serious games that I invest my time on. Most of those games were still a year or so away. I was still playing better games on the PS2 and my current Maplestory addiction. My ex also bought Rock Band 2 for me and my siblings, even though I told her it’s a waste. It’s a nice party game, but it’s not a game I seriously invest my time on or the fact that I don’t really host parties lol. It was about 6 months or so after (2009) when all the good games were released. Over the next two years, not in any particular order, I got Fallout 3, Metal Gear Solid 4, Dante’s Inferno, Heavy Rain, Brutal Legend, Final Fantasy XIII, Silent Hill: Homecoming, Call of Duty 4: Modern Warfare, Mirror’s Edge, L.A. Noire, Nier and God of War 3. I reached level 200 in Maplestory in late 2012. I’m probably the only one among my friends in college to ever reach this achievement (no cheating or private servers). I stopped playing shortly in early 2013. I haven’t beaten Silent Hill: Homecoming. I also bought a copy of Silent Hill: Downpour. I haven’t played it yet. I haven’t beaten Fallout 3. I actually traded my copy of it. At first I thought about buying the Game of the Year edition of Fallout 3 and Fallout: New Vegas, but I felt it was too much Elder Scroll mechanics for me. I did beat Call of Duty 4: Modern Warfare. I also got copies of their direct sequels, Modern Warfare 2 and 3. Also beat them. Metal Gear Solid 4, Dante’s Inferno and Mirror’s Edge were the only serious game I invested my time on in 2009-2010. When I started playing Final Fantasy XIII on my fat PS3, it actually broke the system. The lens was fried and could no longer play any disks, Blu-Ray or DVD. The system is still operational for downloaded games and is now sitting in the basement. I bought the Killzone 3 bundle of the slim PS3. I beat Killzone 3 (didn’t really care about multiplayer). I started playing Nier, Brutal Legend, Heavy Rain, God of War 3 and L.A. Noire around 2010. I beat God of War 3 and Nier in 2011. I just beat the other three games earlier this year. Sony had problems with the PSN in 2011 and closed it for a while. As their “Welcome Back” package, they gave away a few PS3 games for download and a trial of PlayStation Plus. I got inFAMOUS and Wipeout. Wipeout was meh. I beat inFAMOUS earlier this year and downloaded a free copy of inFAMOUS 2 as a PlayStation Plus member. Still have yet to beat it. E3 in 2012 showcased a trailer for Assassin’s Creed III. That got my so hyped up that I bought the previous Assassin’s Creed games (1, 2, Brotherhood, Revelations) and beat them in the 3 months leading up to the release of AC3 in October 2012. I bought Assassin’s Creed 4: Black Flag on release date. I beat it about 3 weeks after. I acquired a bunch of PSN games. flOw, Flower, Journey, Datura, Machinarium, etc. Already beat them. I got The Walking Dead: A Tell-Tale Game and the 400 Days DLC. Still waiting for Season 2. I acquired Ni no Kuni and Bioshock: Infinite from Amazon. Bioshock: Infinite includes a free copy of the first Bioshock. I’m actually playing that one first. I started playing Ni no Kuni. It’s a fun J-RPG. I got Beyond: Two Souls. Many people were turned off by this game, but it’s a definite improvement as the spiritual-successor to Heavy Rain. It had better dialogue, acting, pacing and story. Because of PlayStation Plus, I’ve had my pick on the litter on free games. I got Uncharted 3 for free. Rather than play this game first, I bought the Uncharted 1 and 2 bundle at Best Buy and beat the first game. I started playing Final Fantasy XIII again. I’m almost done with the game. I bought Final Fantasy XIII-2 last year for $15 at Target. The final sequel, Lightning Returns: Final Fantasy XIII comes out next year. 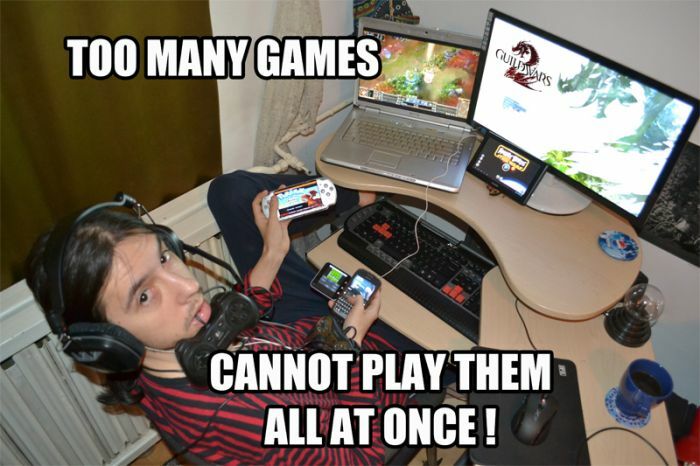 The problem with gaming is that there are too many games distracting you from playing and completing previous games. I literally have games lying around enough to last me for another year, provided I don’t purchase anymore. With PS4 already out, it’s only a matter of time before I make the switch.